What is love? Baby don’t hurt me, don’t hurt me, no more. Disclaimer: I was still a teenager (18) when I watched Toradora, so please understand that me adoring Taiga (who is 17 in the end of the show) is perfectly fine. But yes Taiga, so small, so cute, so waifu. But to be more serious, the reason why I had a crush on Taiga, was not just because of herself, I was more thanks to Ryuuji, who I admired and wanted to become so that I could support my own Taiga. 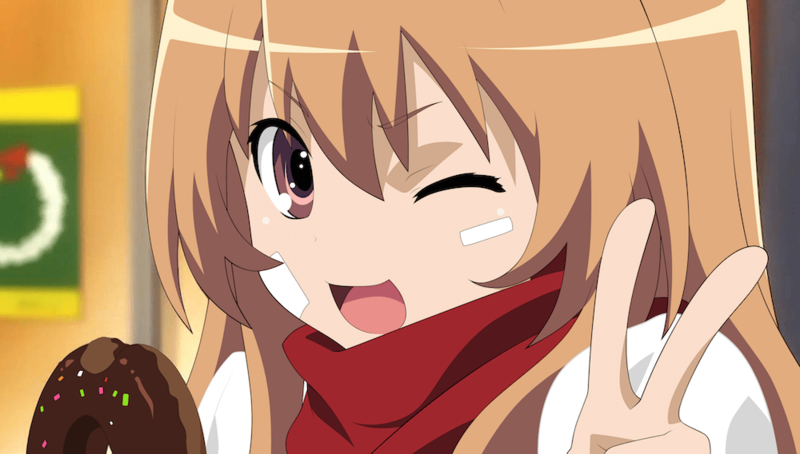 Basically if I wish I were in Ryuuji’s shoes and have Taiga as my waifu. Taiga is small and cute, but she is also a Tsundere. While I like tsunderes, sometimes they are a bit too violent, and Taiga is no exception. However the concept of love from hate has always been something that I thought was amazing and to be one of the most strongest forms of love. Also her growth throughout the series is something I would love to see in any girl I am with. Taiga started off in a dirty house by herself, not knowing how to take care of herself or interact with people, but thanks to Ryuuji, she grew into a fine girl with lots of friends and housewife skills that can only match Ryuuji himself. One thing I still can’t forgive her for is leaving him for 1 year, I think there could have been a better compromise, but thats not something I can change. So thats why Taiga is my first anime crush and my top waifu. If there is a real life version of her, please introduce me to her!